Best Used Four Wheelers Rated by Price. Top Rated Used ATVs By Price Category. Ever wonder which used four wheelers are the best value? Before we spend our hard earned cash, we sure do! if you're thinking about buying a used ATV, wouldn't you like to know which models are rated the most highly by their current owners? We thought that would be a great way to help determine which used four wheelers would be the best value for the typical used utility ATV buyer. If owners have lived with these ATVs for a while and still love them, chances are that you would too. A quick brain storming session hatched the idea of analyzing owner surveys to find out which used ATVs got the best ratings. These surveys measured overall owner satisfaction with the ATV. Several categories were included that focused on the owner's impressions of quality, ease of use, performance, and dependability. Only 4x4 recreation/utility ATVs are covered in this report because this sort of thing is really time consuming, and because this category of used four wheelers is by far the most popular. It was decided to separate our results by price range. If you're like us, you like to know how much ATV your dollars will buy. This gives you a quick reference by price of all these absolute best of the best used four wheelers. The prices were determined by current Kelly Blue Book listings. Keep in mind these prices are top dealer retail for used ATVs in excellent condition. In most cases, an actual selling price will be somewhat less. So just regard these prices as a good starting point. Which used ATV to buy? Check the list below. Best Used Four Wheelers - $3,000 to $4,000. 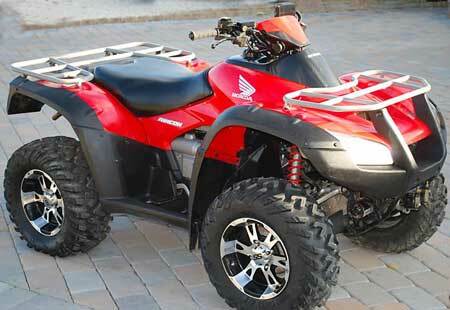 A used ATV in excellent condition is the best deal for your money. Best Used 4 Wheelers Over $5,000. It's evident that the three most popular makes - Honda, Polaris, and Yamaha - also dominated this list of the best values in used four wheelers. We aren't going to say that these are the only used ATVs to consider, but we do think the ATVs on this list represent the best bang for your bucks. Top Used Four Wheelers by Make and Model.